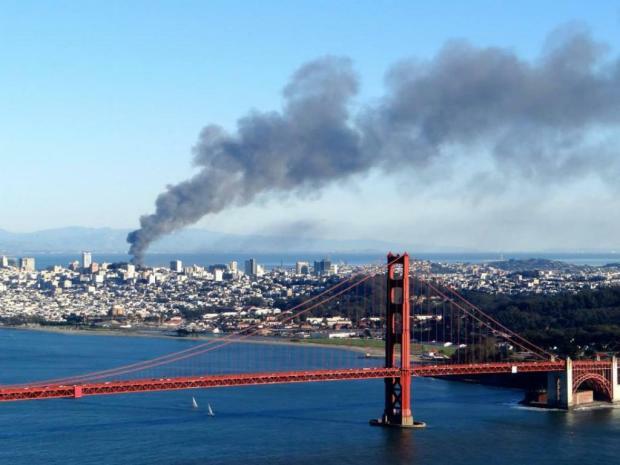 A massive, multiple-alarm fire at Fourth and China Basin streets in San Francisco's Mission Bay neighborhood burned for hours Tuesday, sending a plume of black smoke high into the sky. The blaze, which burned at an apartment building under construction just south of AT&T Park, was reported at 4:56 p.m.
As daylight waned, the flames calmed and the smoke turned from black to white. San Francisco police spokesman Sgt. Eric O'Neal said in a statement that all residents on the east side of Fourth Street had been evacuated and that the Red Cross was on the scene. About 150 firefighters responded to the blaze and prevented the fire from spreading to nearby buildings. Teams were expected to remain there throughout the night. Aerial footage of San Francisco firefighters battling a massive, multiple-alarm blaze late Tuesday in the city's Mission Bay neighborhood. 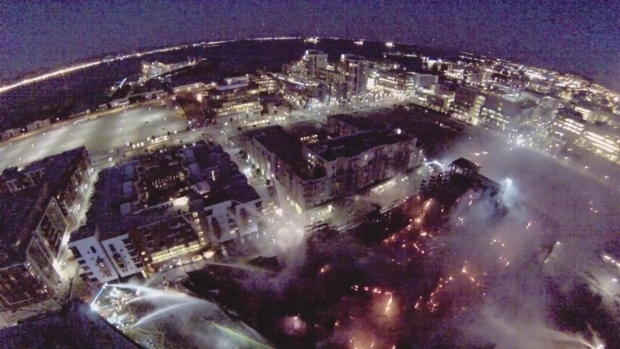 The video was shot by an NBC Bay Area viewer using a quadcopter drone. A firefighter suffered minor burns battling the blaze and was transported to a hospital, officials said. San Francisco Fire Department Chief Joanne Hayes-White also said crews would let the building collapse upon itself. The cause of the blaze was not immediately clear. 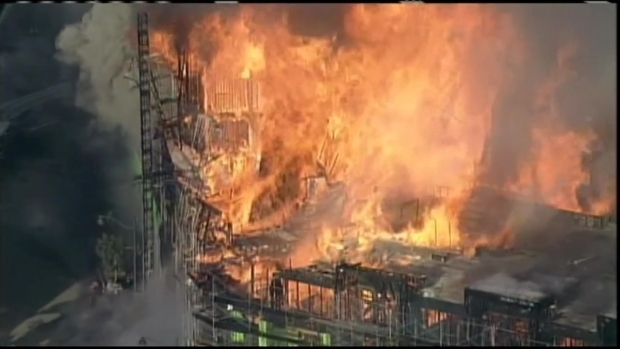 Raw footage from the NBC chopper showing a portion of a building collapsing during a massive fire near AT&T Park in San Francisco. The fire torched what was due to become a 172-unit apartment complex. The site is owned by the San Francisco-based BRE Properties. 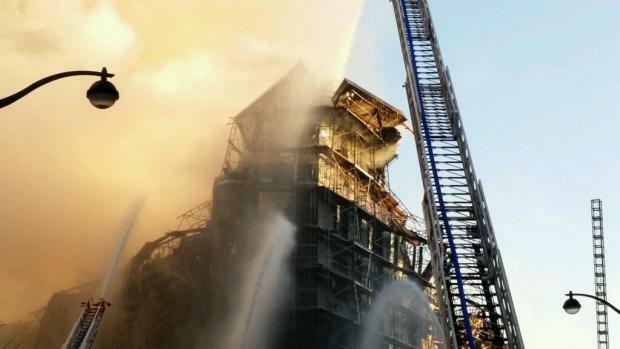 The company late Tuesday said a cause of the fire is unknown and that all associates and contractors were safely evacuated from the construction site. San Francisco Fire Department spokeswoman Mindy Talmadge said the fact that building was under construction made battling the blaze more difficult because the building's fire suppression systems had not been completely installed. NBC Bay Area's Terry McSweeney provides an update on a massive, multi-alarm fire that erupted near AT&T Park in San Francisco Tuesday afternoon. Workers were in the process of installing sprinklers, but none were working yet, according to public records. Strong northerly winds gusting up to 30 mph were blowing smoke from the fire south toward Potrero Hill and the Dogpatch neighborhoods, according to NBC Bay Area meteorologist Jeff Ranieri. 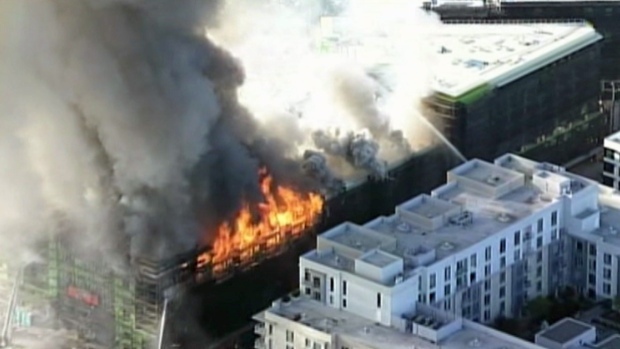 Fire crews battle a massive, multi-alarm blaze at a building under construction near AT&T Park in San Francisco. 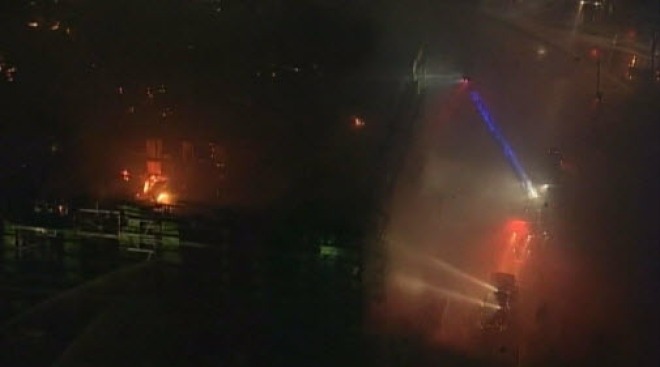 Witnesses near the scene told NBC Bay Area's Stephen Stock they were concerned about the fire spreading to occupied buildings. "I'm looking at a pretty bad fire here,” the witness said. “You can feel it." Firefighters on the scene confirmed that burning embers from the fire spread to the roof of the nearby Smith Cardiovascular Research Center at UCSF, but crews were able to quickly extinguish those flames. San Francisco-resident Janice Jentz was on her way home from work when she saw large clouds of smoke hovering over her building. "(I) started running home and tried to make sure he was rescued and he was OK," Jentz said of her dog, who firefighters were able to rescue. "I'm happy they pulled through and helped me out." The Mission Bay site is 3.7 acres on two parcels and represents BRE’s only property in the Mission Bay neighborhood of San Francisco. BRE reportedly expected the cost of the development to be around $227 million, or $630,000 per unit. The Mission Bay project is one of five the company has under construction in California and Washington. There are two other projects underway in the Bay Area, one in Sunnyvale and one in Redwood City. Suffolk Construction is the contractor working on the building. The company had "no comment" when contacted by NBC Bay Area. View aerial footage of the fire crews battling the blaze late Tuesday in the video below. The video was submitted by an NBC Bay Area viewer and was filmed using a quadcopter drone. 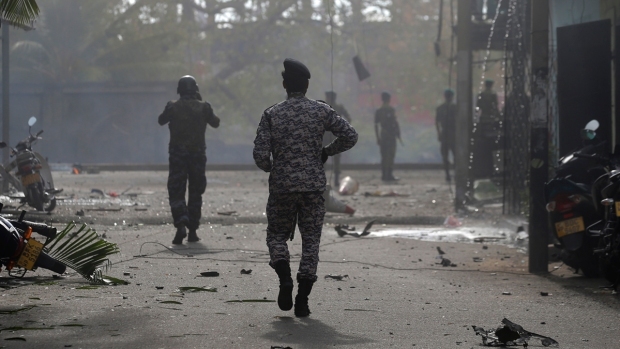 The Associated Press and Bay City News contributed to this report.